So excited to do this post. Just going through the photos brings a smile to my face 🙂 And that, I think, is what I did miss about blogging. So my girl is turning the big 2, and we decided to have her birthday do a little earlier this year as it is getting rather hot outdoors. 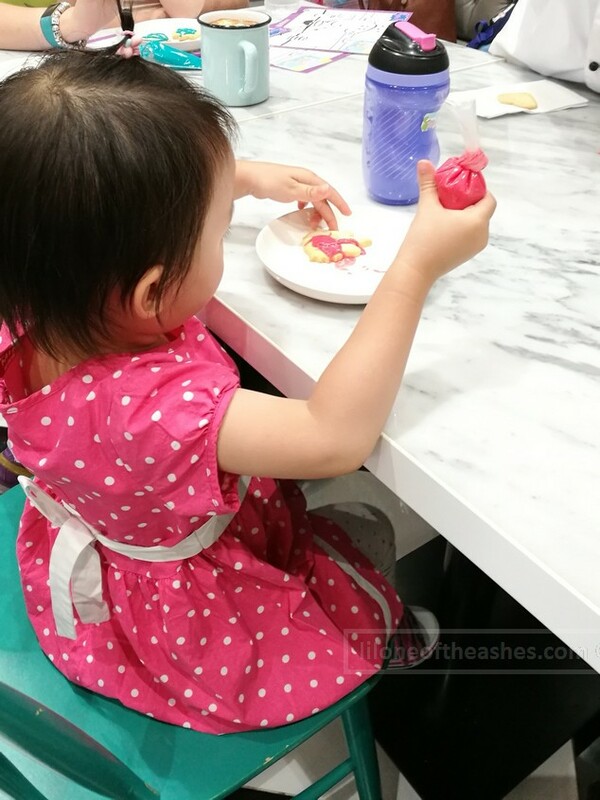 Whilst I was chatting with the owner of Ella’s Creamery about themes – I knew they had some default ones but my girl was not a fan of unicorns as yet. Or airplanes. Her favourite show was Peppa Pig 🙂 When the owner said OK with Peppa, I was absolutely delighted. Like a little girl again. I couldn’t wait to see how it will turn out. We headed over to Riverland on Saturday. 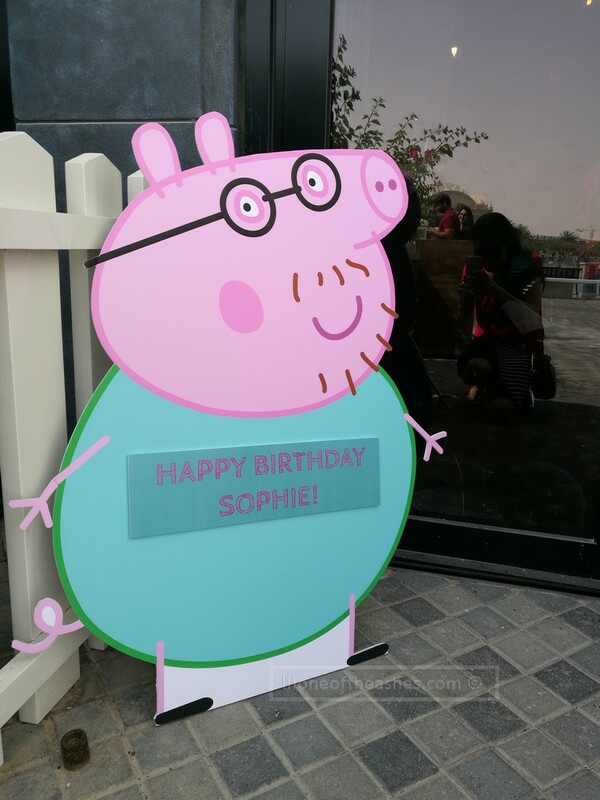 Outside the front door of Ella’s was a massive Daddy Pig cutout with ‘Happy Birthday Sophie’ on it. It was so cute. Sophie was a little scared at first. I think she didn’t quite understand what Daddy Pig was doing in front of this shop, or rather, what he was doing outside of our TV at home 🙂 After a few photo attempts, she did wave a little, and we brought her indoors. To be honest, the setup inside was beyond our expectations. 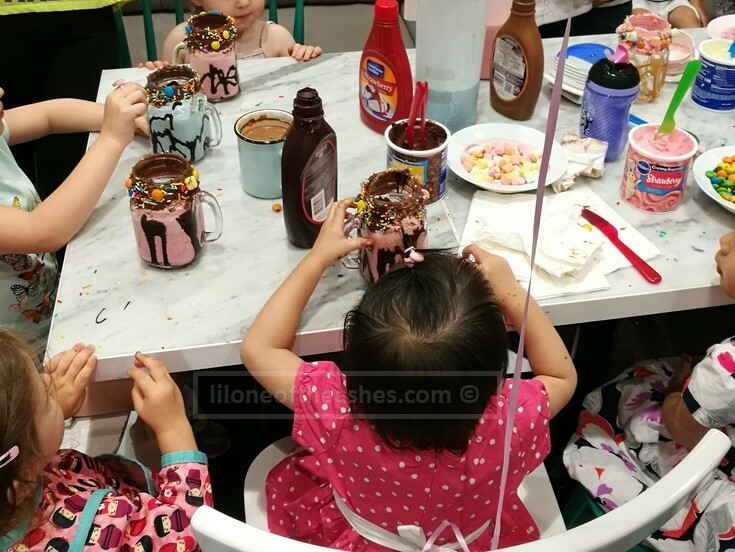 All the little details, from the main table with cake, cupcakes and lollies and balloons, to the main kid’s table, to the play area at the back. Photos will describe it best. Here’s a little photo blog of Sophie’s special day. Daddy Pig welcomes Sophie to Ella’s Creamery! Right near the entrance was a display table with balloons, Peppa-themed cake, Peppa-themed cupcakes, and lots of lollies. Perfect spot for a family photoshoot. Little Peppa and George cutouts on the main table, to join the kids. 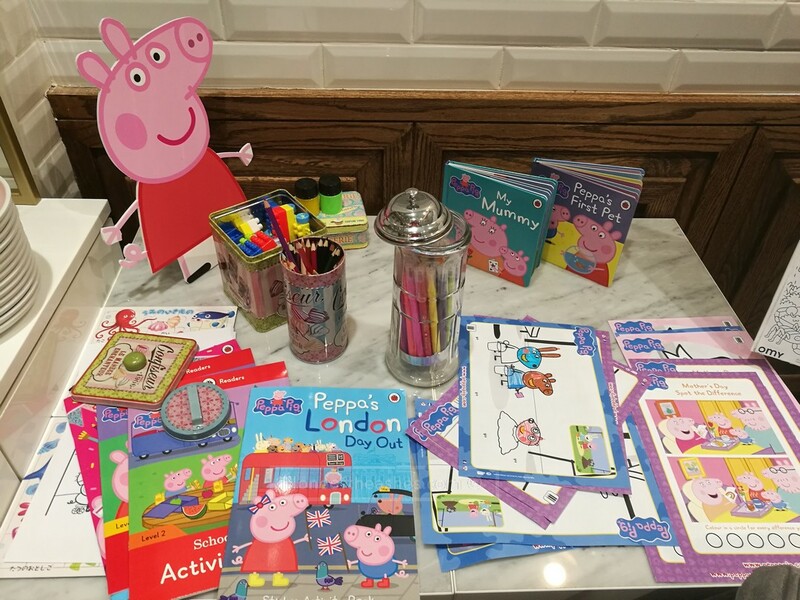 Lots of thought went into setting this up I could see – the Peppa-themed plates, cups and napkins, with colouring-in as tablemats. Even water bottles with my girl’s name on it, ha ha! I took two home. I need to learn a bit of this to do this in our own house! Right at the back there was a pretty little arts & crafts table set up with books, and lots of colouring paper to keep the kids busy. The kids were then lead to do some cookie decorating. Most of the icing went on Sophie’s face. Haha. This was super fun, with the chef and the staff from Ella’s guiding the kids on how to prepare a crazy shake. After the kids were done, they were then brought to the main table to have a sip of this sugary goodness (or otherwise, taken away by their parents so they could indulge in it). More colouring and photos, then…. party time! Eliza, the host (love her!) was so good. Loud, as you should, with 2-5 year olds. Lots of dancing was involved. Sorry no photos for this one to share with the public as there’s too many faces in there, hehe. Rajesh taking a shot of the ice cream for the winners! Can I take you home, George? Many thanks to Donald for getting all organised, to Rajesh for getting the tableware, to Chef for making the gorgeous cupcakes and preparing the cookies and crazy shake, and to Eliza for being the super host of the day so mummy and daddy didn’t have to stress. And to the rest of the staff who kept the guests happy and hydrated throughout the afternoon! Option 1 : Park at Public Parking, take the tram and get off at Motiongate, it’s a 2 minute walk from there. Option 2 : Part at VIP Parking, it’s a 2 minute walk from there. And for it to be one about my friend’s ice cream shop – awesome! I’m so glad you guys had a great time!